Crushing Hyper Turbo HUSNGs is the premier hyper turbo poker video pack. 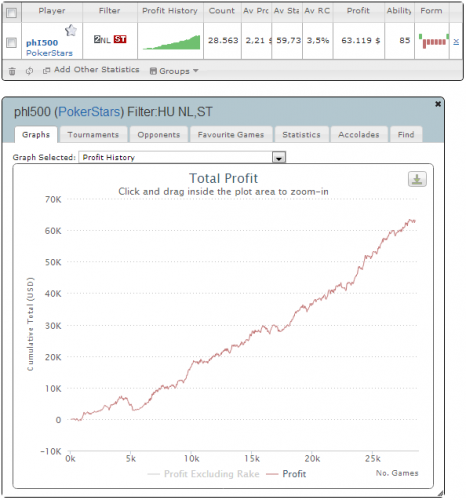 Authors zZzTILT and phl500 have shown excellent results both at the tables and in private coaching. They've teamed up to bring you the ultimate guide to playing and winning in one of the fastest growing and most profitable games today: hyper turbo heads up sngs. zZzTILT has enjoyed tremendous success in the game of hyper turbos. Known for his intense dedication to breaking down opponents and discovering new strategies to stay ahead of the curve, as well as coaching dozens of students over hundreds of hours, Matt brings a lot to the table in this comprehensive video package. Fellow professional poker player, phl500, has also had a very good record in hyper turbos. He's been playing this format over a year now, and has been a consistent winner. He also has excellent feedback from taikogod and eric2991, talking about his strengths of being a natural teacher, having "fish crushing" skills, and giving a professional coaching experience that stresses life balance. Below are Phil's hyper turbo stats. Below is a detailed breakdown of what you can expect to find in this video pack, with free preview clips on some sections of the pack. These clips are taken directly from the pack, so you can see the type of premium content you'll enjoy after purchase. - Which boards/range should I donkbet? Phil and Matt review Phil's play on two tables at the $60 and $100 hyper turbo level on PokerStars. Matt and Phil review $60 and $100 hyper regular not_so_good0's play on two tables.